The origins of the British Trolleybus Society go back to April 1961. It was then that 14 enthusiasts got together and formed the Reading Transport Society with the aim of buying a vintage 1939 AEC trolleybus which was due to be retired by Reading Corporation Transport later that year. Their dream came to fruition when in September 1961, No. 113 was successfully purchased for preservation, the first trolleybus to be privately preserved. Although it was intended to be a local Society, membership spread nationwide rapidly. With trolleybuses fast disappearing from the streets in the 1960s it was not long before other trolleybuses were added to the preserved fleet which was kept in outside storage at a coach depot in the south of Reading. South Shields 204, Bournemouth 99 (212) and Cardiff 203 had joined Reading 113 by 1964. Tours of the remaining systems were arranged for members and the strength of the Society membership was such that it set about trying to convince the remaining trolleybus operators in the U.K. that trolleybuses were worth retaining, if only for environmental issues. Alas, we were ignored, as this was not seen as important in those days. Against a background of trolleybus systems being abandoned at an alarming rate and the number of trolleybuses in preservation growing fast, the search was on to find suitable land in which to build an operational trolleybus museum to run the preserved fleet. The breakthrough came in 1969 when an old airfield at Sandtoft (between Doncaster and Scunthorpe) was purchased and, with the involvement of other transport enthusiasts groups, the Trolleybus Museum at Sandtoft was born. At the same time we expanded our horizons and introduced our World News column, which reports on trolleybus developments throughout the world. The last trolleybus to operate in public service within the UK ran in Bradford in March 1972 but it was only a matter of a few months after that the first trolleybus ran at Sandtoft. Since that time our Society has played a full part in the growth of the Trolleybus Museum at Sandtoft , a museum held in high regard throughout the bus enthusiasts' circle as well as educational establishments. Our trolleybus fleet is gradually being restored with Reading 113 being completed and returned to service in 1999 and Glasgow TB78 and London 1812 having joined her in 2001. Bournemouth 99 was sufficiently restored for her to return to limited use in 2003 with South Shields 204 following in 2005. Cardiff 203 was relaunched into service at The Trolleybus Museum at Sandtoft fully restored over the Spring Bank Holiday 2010. Manchester 1344 was restored and relaunched during the BTS's 50th anniversary celebrations at the TM@S over the Spring Bank Holiday 2011 and Walsall 872 would have been relaunched over the August Bank Holiday 2013 had a brake problem not been too difficult to solve in time. Huddersfiled 631 is the latest vehicle currently being restored. To celebrate our 45th anniversary, and also to commemorate 70 years since trolleybuses commenced operations in Reading, we staged a very successful ‘Reading Trolleybuses Recalled’ event at the Trolleybus Museum at Sandtoft (TM@S) over the Spring Bank Holiday 2006 where we managed to operate 5 vintage Reading trolleybuses together with 6 contemporary Reading motorbuses. Other major BTS Trolleybus events at Sandtoft have been held, including helping the Trolleybus Museum At Sandtoft celebrate its 40th anniversary over the Spring Bank Holiday in 2009, when 7 of the 17 trolleybuses operated that weekend were from from the BTS fleet. 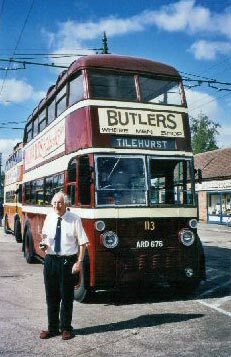 The British Trolleybus Society celebrated its 50th anniversary in 2011 and a number of events took place between April and July. Click here for details. We are now in the process of buying additional land at Sandtoft in conjuction with the TM@S so that we can secure our fleet of vehicles in our own depot whilst also assisting with the expansion of the museum site.